Oculus VR, the startup behind the renowned Oculus Rift virtual reality glasses, has snagged $16 million in investment funding. Considering the company's well-known desire to get its VR headware into the public's hands, we'll take that to mean a consumer product version is practically a lock. Only Kickstarter funders and devs have been able to get their hands on the device. Not that there are a whole lot of games that support it — just a few at present — but it's starting to catch on with the game developer community. More are jumping on the bandwagon, and not just for support. Some are even pledging to build fully VR games around the device, which just showed up in HD form at E3 last week. That could have aided Oculus VR's cause in raising money, and if that was the plan, then it succeeded beautifully. In addition to soaking a windfall of cashflow into the venture, investors like Santo Politi of Spark Capital and Antonio Rodriguez of Matrix Partners will be guiding the company firsthand as new members of the board. The company's genesis has been like a rags to riches story. Last year, when it landed on Kickstarter, it crossed its fingers and hoped for a generous $250,000. By the end, what it wound up getting was a breathtaking $2+ million. These days, customers pick up the device via $300 dev kits, but Oculus has its eyeball on the big prize — mass consumer availability. And now, it is well on its way. IRVINE, CALIFORNIA – Oculus VR, Inc., developer of the highly anticipated Oculus Rift, today announced that it has closed $16 million in Series A funding. The round was co-led by Spark Capital and Matrix Partners. Santo Politi, founder and general partner at Spark, and Antonio Rodriguez, serial entrepreneur and general partner at Matrix, have joined the company's board of directors. Founders Fund as well as Formation 8 also participated in the round. The funds will be used to accelerate the development of virtual reality hardware, software and services, ultimately creating a full virtual reality platform for consumers. "Oculus began with a single mission: to put players inside the game," said Palmer Luckey, founder of Oculus VR and inventor of the Oculus Rift. "This investment allows us to deliver immersive and affordable virtual reality to players everywhere." The Oculus Rift is a virtual reality headset that provides an immersive, stereoscopic 3D experience with a huge field of view-110 degrees diagonally-and that overcomes latency challenges. A prototype of the Oculus Rift first appeared at E3 2012, immediately earning praise from the industry. Just one year later, Oculus has manufactured and successfully shipped the Rift development kits purchased in its Kickstarter campaign, allowing game developers across the globe to create Oculus-ready applications and interactive content. "With the recent console announcements and the advent of stronger mobile technology, we're watching the video game industry keenly," said Mr. Politi. "In our estimation, Oculus is one of the only companies in the space with something completely new and disruptive. They have the right team, capital and vision to take virtual reality beyond console gaming and into everyday computing." "In this business, there are only a few rare companies that can so perfectly embody the future you read about in science fiction novels," said Mr. Rodriguez. "What Palmer, Brendan and the team are building at Oculus so closely matches the Metaverse, we had to be part of it. Working with them to get this platform to market at scale will be enormously exciting." Founded in 2005, Spark Capital's track record of backing extraordinary, forward-thinking ventures, including Twitter and Tumblr, has served as a barometer for innovation in the tech industry. Matrix Partners' achievements span decades and include early investments in some of the world's most successful technology companies, such as Apple, SanDisk and many others. "What better way to mark our first anniversary than to announce our next phase of growth," said Brendan Iribe, CEO of Oculus VR. "There are still many challenging problems to solve, but with the support of these great investment partners, and our passionate community, we will continue to hire the brightest minds and stay laser focused on delivering the very best virtual reality platform possible." Oculus VR previously raised over $2.4 million through its Kickstarter campaign – almost 10 times its fundraising goal – and developers are actively supporting the headset. No release date has been set for commercial release. 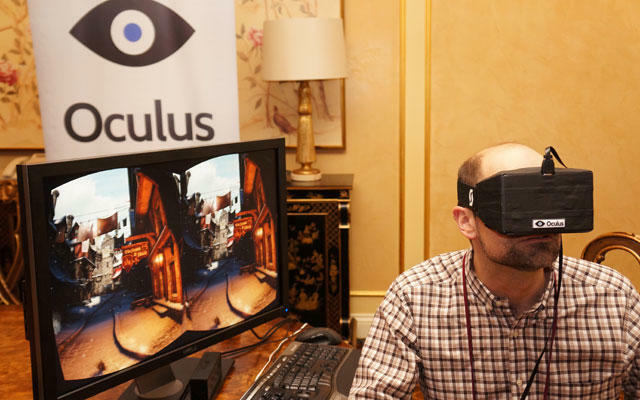 To stay updated on Oculus' progress, please visit www.oculusvr.com.